Dr. Maya Kant Awasthi is with the Indian Institute of Management (IIM) Lucknow in Food and Agribusiness Management area since December 2004. 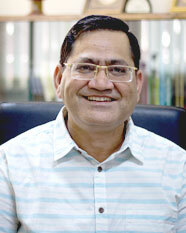 He is a Professor at Food and Agribusiness Management Centre of IIM Lucknow. Before joining IIM Lucknow he has worked with IIM Ahmedabad, NDDB/NTGCF Anand and AIM Guwahati. He holds Ph.D. (Agril Economics) from GB Pant University of Ag and Tech Pantnagar. Land Valuation and Land Marketing. Recipient of National Integrated Scholarship, IVRI Jr Fellowship and Doctoral Fellowship of Ministry of Tribal Affairs, Government of India. Member, Advisory Board of NWA, Central Water Commission, Government of India. Member Advisory Group on Agriculture and Food Processing, Ministry of Finance , Government of India. Member of Zonal Technology Management Committee of India Council of Agricultural Research of Government of India. Member of School Board of School for Management Studies, BB Ambedkar University (Central University), Lucknow. Member of Board of Studies of North Eastern Hill University (Central University), Meghalaya.